Life on the road in an RV is fun and exciting, but it’s not without its own set of challenges. One of the more common issues you’ll have on your adventures is getting a flat tire. Whether it happens while driving or while you’re parked overnight, a flat can derail your plans immediately. Unfortunately, if you’re not prepared, it can be more than a little challenging to get your rig back on the road. Thankfully, all it takes to alleviate this potential problem is to have the best RV air compressor. Today we’re going to be looking at the best compressors and how they can give you peace of mind on your next RV excursion. When picking out an air compressor for life on the road, you will have to decide whether you want a model that runs off of your RV’s battery (12-volt) or one that plugs into an outlet (120 volts). This unit from Viair is one of the former options, meaning that you need to operate it while your RV is running to avoid draining the battery. It also means that this air compressor can only be used for a relatively short period before having to cool off. Nonetheless, this particular model has some incredible features that make it an ideal choice for any RVer. Considering that most RV tires are kept at around 80 psi (for comparison, most cars are about 35 psi), you need a compressor that is capable of reaching this amount of pressure. Thankfully, you can get up to 150 psi, meaning that you have more than enough room to spare. One thing to keep in mind, however, is that because this compressor doesn’t have a tank (more on those later on), it may take a little longer to restore a tire from flat. Hopefully, you won’t have to fill more than one tire at a time, but if so, you should let the machine cool down between uses. Since this machine plugs into your RV’s 12-volt adapter, you have to be sure that the hose will reach all of your tires, including those in the back. Thankfully, with this 60-foot hose, that shouldn’t be an issue. To make things better for storage purposes, the hose coils up like a spring when not in use so that you can keep it in the carrying bag along with everything else. When you go to a gas station to fill your tires, you’ll notice that they come with an inflation gun that has a handy gauge on it, showing you the tire pressure as you fill it. Fortunately, this compressor also has such a device, enabling you to work more efficiently because you can easily tell how much is left. There are two other attachments you can use to fill the tires, and the compressor will shut off automatically when the tire is full so that you don’t have to worry about over inflation. Overall, 12-volt air compressors are ideal for tires that are low, not flat. Because they aren’t drawing as much power as a 120-volt model, it can take a lot longer to get air into the tube. Compared to most 12-volt compressors, though, this one works faster and more efficiently. I like that it comes with a host of accessories and that it has a more powerful motor than normal. If you’re going to go the 12-volt route, this is by far the best option. As with all 12-volt compressors, the most dangerous aspect is heat. After a few minutes of running, you’ll notice that the compressor itself and the coupling for the hose are scalding hot, so be sure to let them cool down before attempting to put the whole thing away. For the most part, if you want an RV air compressor that is fast and convenient, a 12-volt model is going to be an excellent choice. Although having a 120-volt version can sometimes work out better in certain circumstances, they usually draw a lot of power, so you need to either have a generator or be plugged into shore power to be safe. So, with that in mind, let’s take a look at another 12-volt compressor to see how it can help you on the road. Because these machines are built for emergency use, they usually don’t have particularly robust motors. They are perfect for filling a tire every so often, but they’re not meant for consistent operation. Thankfully, this model from Tirewell has a dual-cylinder pump and a direct drive motor. This means that it will hold up better when filling RV tires from flat, and it won’t break down as easily. Also, this type of motor works more efficiently than other compressors. Although the easiest way to use this type of inflator is to plug it into the 12-volt jack inside your RV, sometimes you may need to connect it to the battery itself. In most cases, this will be necessary if you have to reach a rear tire, since the five-meter hose may not go that far. Thankfully, having this battery clamp enables you to connect the inflator to one of your other deep-cycle RV batteries, ensuring that you can stabilize all of your tires, no matter which one needs inflation. As I’ve mentioned, 12-volt air compressors can get incredibly hot when they’ve been running for a while. Fortunately, you don’t have to burn yourself by accident, thanks to the safety handle built into this machine. It comes with thick padding so that you can move it from one tire to the next quickly and safely. Compared to some of the other 12-volt air compressors out there, I like that this model is more rugged and well built. I also appreciate the safety handle and the ability to plug it directly to a deep-cycle battery if necessary. The hose is not long enough to reach all of your RV tires, so keep that in mind. Also, it has a relatively short cycle period of 10 minutes, so be aware that filling a flat could take a lot longer since you have to wait for the motor to cool off before it’s finished. Another thing to pay attention to when choosing the best RV air compressor is the brand. In this case, Porter-Cable is well-known for making high-quality tools and accessories, so you know that you can trust it more than some of the lesser known companies out there. Since this is a 120-volt compressor, it doesn’t plug into your RV’s cigarette lighter, but rather it goes into an outlet. This feature also means that it can work faster and more efficiently. Let’s see what it can do. If you’re not familiar with air compressors and how they work, having a tank makes filling your RV tires so much easier. The reason for this is that the container allows the motor to work smarter, not harder. As the air comes into the tank, it becomes pressurized as more air is pumped inside. This pressurized air is then fed through the hose out of the nozzle, meaning that if you have a large tank, you can use the compressor for a longer period before it recycles (refills itself). Although this model only has 1.5 gallons, it’s more than enough for tire inflation. Not only does this feature give you more reliable air flow and pressure, but it reduces the wear and tear on the motor since it doesn’t have to run the whole time. When you look at the Viair pump above, it has 2.3 CFM (cubic feet per minute) airflow at zero PSI. Thus, when you have pressurized air, the flow rate drops drastically. As you can see, this model is much more efficient because air can flow faster at a higher pressure. For comparison, you can fill your tire in a couple of minutes with this compressor (even from flat), while the Viair and other 12-volt models can take 10-20 minutes for a single tire. As I mentioned, having a tank means less wear and tear on the motor, since you can use the air inside until it needs to recycle. Thankfully, this motor also doesn’t use oil, meaning that it’s designed to operate as efficiently as possible. Overall, you can rely on this compressor to last a lot longer than other models in its class. I’m familiar with the Porter-Cable brand, and I like what the company has to offer. This inflator is much more efficient than a 12-volt, but be aware that it can draw quite a bit of power from your batteries unless you’re plugged into shore power. I like that it has a long hose and that the airflow rate is sufficient for fast tire inflation. I also appreciate the relatively small size and lightweight design. Although Porter-Cable is mostly reliable, sometimes this compressor can have issues. First, the inflation accessories are not very rugged. Thankfully, they are made for inflating things like basketballs, so you shouldn’t have to use them often. The other issue with this compressor is that it can sometimes be whiny and loud. It’s rare, but if it happens, the motor is not going to last very long, and you’ll have to find a replacement. Typically speaking, a 12-volt air compressor is a relatively simple device with a hose, a motor, and a pressure gauge. However, if you want something a bit more high-tech, then this model from GooLoo is going to be right up your alley. Let’s see how it stacks up. If you’ve ever had to fill a tire at night, you know that it can be frustrating when you can’t see what you’re doing. Thankfully, this compressor comes with a high-powered flashlight built-in so that you can illuminate the tire and connect it that much easier. Also, you can use it just as a light if necessary, adding to the versatility of this model. Seeing the tire is one thing, but seeing the gauge is something else. Fortunately, this compressor has a backlit digital LED screen, meaning that you can always see the pressure no matter the lighting conditions. Another excellent thing about this model is that you can set the tire pressure in advance, and the compressor will shut off once it reaches that number. So, over inflating your tires is never a concern, and you can let it run without having to watch it the whole time. Overall, air compressors are loud devices, so no matter which one you pick, you need to be prepared for that. However, compared to some of the other 12-volt inflators we’ve seen, this is one of the quietest units you can find. The technological aspect of this compressor is the primary highlight. I like the fact that you can program the pressure setting, which enables you to let the machine operate without having to babysit it. I also appreciate the inclusion of a flashlight to help you see what you’re doing. Simply put, this compressor is built for cars and SUVs, not RVs. It has a short hose, so you will need either an adapter for the hose or the 12-volt plug. I’m not sure where you can find either of these, so it may be a moot point overall. What size air compressor do I need to inflate RV tires? Technically speaking, any air compressor can inflate an RV tire. However, the primary difference is how long it will take. Since these tires are kept at a much higher pressure than most cars and SUVs, you want something that won’t take half an hour to inflate. As I mentioned above, something with a tank is going to make short work of any tire, so if time is a concern, I would highly recommend anything with at least 1.5 or two gallons. While you could get a larger model, it won’t make that much of a difference, and it will only take up more space. How to maintain and check RV tire pressure? I highly recommend buying a high-pressure tire gauge. Most gauges you find are suited for cars, meaning that they max out at about 65 psi. Since your RV tires are going to be 80 (or more), you need a gauge that can go that high. Check your tire pressure regularly (every other month if possible), and always check your tires if your RV has been sitting around for a while in between trips. Another tip is to reduce your tire pressure when you’re keeping your RV parked. If it’s going to be a few months before you hit the road, lowering the pressure by about 10-15 psi will help the tires stay in better shape. Just remember to inflate them again before driving off. When you’re on the road, you’ll want to check your tire pressure every few thousand miles. Since tires will lose air slightly the more they’re used, it’s beneficial to top them off as needed. Doing this will help you maximize your fuel efficiency. Why not use a Cigarette Lighter Style Air Compressor? I’ve talked about the benefits of having a 120-volt air compressor, so if you don’t like the idea of spending 10-20 minutes inflating a tire, I highly recommend buying one of those models. That being said, a compressor with a tank is going to take up more room in your RV, so if you’re short on space, then a 12-volt inflator can still get the job done. I suggest buying a model with automatic shutoff so that you can let it run without having to watch the gauge the whole time. What does “Duty Cycle” mean? This term refers to the length of time a compressor can run before having to shut off to cool down. Typically, it’s rated in percentages, with the number referring to how long the machine can run within a given cycle period (usually about 10 minutes). To put it into perspective, if a compressor has a 35% duty cycle of 10 minutes, that means that it can only run for about 3 1/2 minutes before needing to cool down. Thus, you want to find a model with as high of a percentage as possible, lest you spend more time inflating your RV tires. 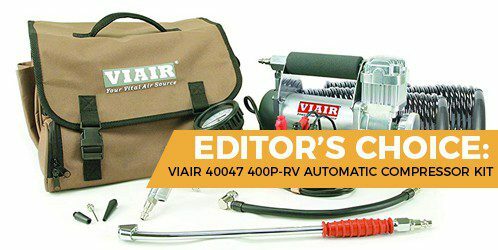 Because this model is so convenient and reliable, I have to say that the Viair Air Compressor is my top pick for best RV air compressor. I like that it comes with a host of different accessories to make inflation easy, and the motor is suitable enough for most tires, even when they’re flat. Overall, using this machine is going to be much more convenient for RVing, as it takes up less space and it can reach all of your tires. Other 120-volt compressors typically don’t have hoses as long as this one, so they can be inefficient, even if they inflate faster.